A Louisiana fundraising event will give kayak fishing enthusiasts the chance to engage in the sport they love while supporting a good cause. The Bayou Pirates Kayak Fishing Club in Louisiana is holding a tournament to support the Heroes on the Water (HOW) organization. The organization helps wounded veterans rehabilitate and relax through kayak fishing outings and spending time outdoors. Through kayak fishing, many veterans are able to regain hope, learn new skills and overcome their perceived injury limits.The HOW organization is based out of Allen, Texas. Donations help the organization provide gear, kayaks, housing, food, transportation and other necessities to wounded warriors. HOW serves wounded veterans in a wide range of communities around the country, including the Marine Wounded Warrior Regiment, Navy Safe Harbor and the Air Force Wounded Warrior. Thus far, the organization has helped more than 6,000 veterans in 24 states. Outings are provided at no cost to the veteran or their family. The tournament will take place at the Red River National Wildlife Refuge on Saturday, February 8 in Bossier City, Louisiana. Anglers who want to participate in the event can register the day of the tournament. Registration fees are $20 per angler. All of the proceeds will benefit the Heroes on the Water organization. The Louisiana director of the organization is expected to attend and participate in the event, which is a catch, photo and release tournament. Prizes for the tournament are still being collected, but thus far there is a SuperNova fishing light, gift certificate to Haydel’s Game Calls, lure pack and bone-hook necklace up for grabs. Kayak fishing enthusiasts in the Bossier City area can take advantage of this opportunity to not only participate in the sport they love, but to help give back to a great cause at the same time. Find The Bayou Pirates Kayak Fishing Club on Facebook! This entry was posted in Kayak Fishing Events on January 23, 2014 by Michael. i love kayak fishing. 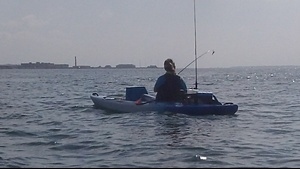 kayak fishing provides me the ability to get any were that a regular boat cant get to.